Have you optimized your website to provide the visitors with an extra comfortable and lightning-fast search functionality? Even if you haven’t, there is great news for you, as this week CrocoBlock team has launched a brand new JetSearch plugin for Elementor! Based on AJAX method, this search plugin allows the visitors to preview the results without the need to complete the search request and proceed to the actual results page. No longer do we need to refresh the page and wait until the results are loaded completely. With JetSearch, all we have to do is input the request into the Search field. The request takes even less than half of a second, and here we are, viewing the best matches for the keywords arranged by relevance, and showcased n the most fitting form. And what if we need to search within the one post type, leaving all the other non-related publications aside? Or, perhaps, we want to search within the specific taxonomy (tag or category – it doesn’t really matter)? With JetSearch, we’ve got you totally covered! Let’s overview the powerful functionality this awesome search plugin for Elementor provides. 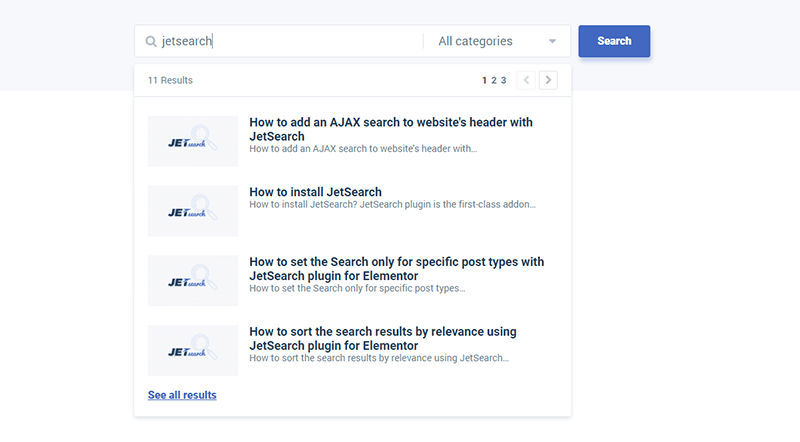 First, before you start working with JetSearch, make sure you’ve already got several posts already published, and there are tags and categories set for these posts in case you want to enable the visitors to look for the content inside the needed category. The next step is to open the template to which you want to add the Search functionality in Elementor visual editor. Once you’ve prepared the section and have specified the column to which you want to add the Search block, drag and drop the Ajax Search widget to the needed place. After that, you will see the default search field with a placeholder text, and a block with the content and style settings on the left, that allows to customize the search form, its settings, change the looks and the way content is displayed in the results area, etc. Actually, that’s everything you need to implement the search to your page. However, let’s overview the cases when you need to enable search within the specific post type, or term. Let’s imagine you need to add a search box to the Shop page and enable the visitors to search only within the Product post type. Open the Search Settings in the Ajax Search Content block and here select Products from the dropdown showcasing the post types you already have on your site. As for the product categories, you can easily add the categories dropdown right beside the Search field to let the visitors define the category within which they want to look for something. Just select the taxonomy which terms you want to display in the Content > Search Form block of the widget, and you’ll see that the dropdown with the terms from the taxonomy has appeared beside the Search field. One of the most attractive features provided by JetSearch for Elementor is that this plugin allows to display the results by relevance. You can define which results are to be shown first, and which ones are to be the last in the list of matching posts. To make sure the post is shown the first you should make sure the search words is contained in its title as well as content and excerpt. In case you want to show the result below the first one, yet somewhere in the top, just remove the search word from its title, leaving it in the content and excerpt fields. The less relevant results should contain the search word only in the title, content or excerpt field. JetSearch plugin for Elementor makes it extra easy to implement the seemingly complicated Search functionality to the pages built with Elementor effortlessly. The plugin is made to be easy-to-use. It’s pretty simple to adjust its style settings to make the search results show up as you need. And one of its key advantages is its amazingly fast speed. 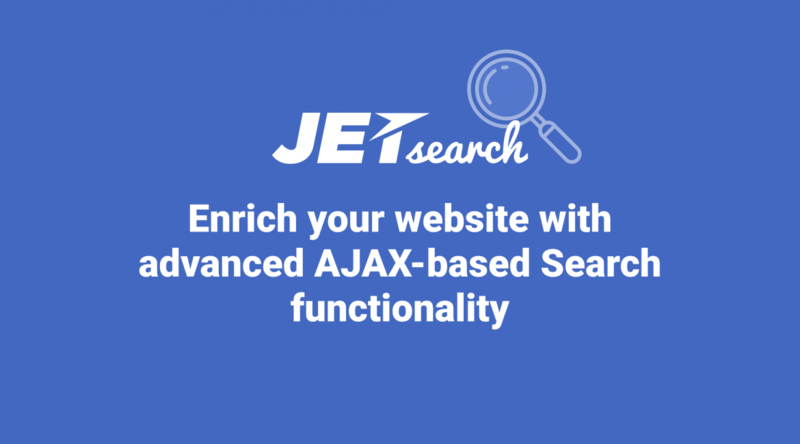 Nowadays it’s hard to imagine a website without Search functionality, and JetSearch simply takes it to the whole new level! Bonitinho mas ordinário! Mesmo buscando, por um texto que não existe, a busca apresenta todos os resultados dos posts.